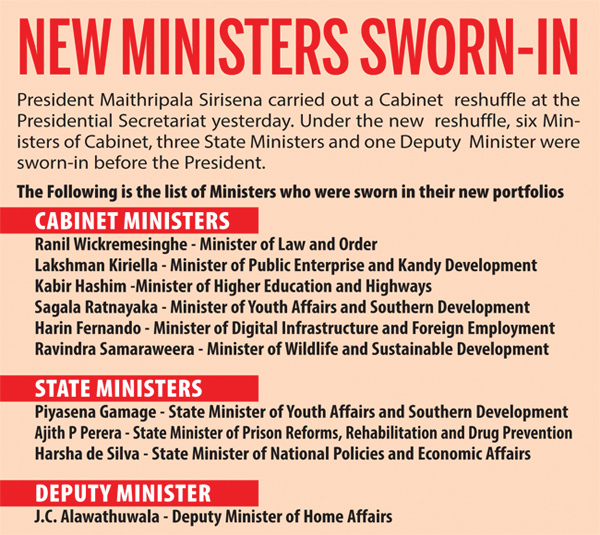 The much awaited Cabinet shuffle of the National Unity Government took place yesterday, with President Maithripala Sirisena changing six ministerial portfolios and appointing three state ministers and one deputy minister. President Sirisena swore in new ministers from the United National Party while promising changes in the United People’s Freedom Alliance portfolios, within the next two weeks. The President, while congratulating the newly appointed Cabinet, State and Deputy Ministers, said in keeping with the message received from the electorate, changes and corrective measures would be taken in order to implement the future programme of work successfully on behalf of the people. “These changes as well as those soon to be made on the UPFA side of the government, will strengthen us to better serve our people,” the President added. 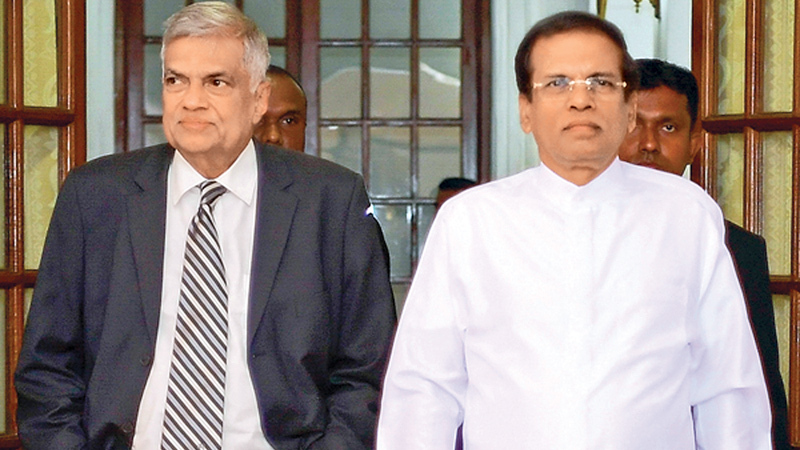 In the Cabinet re-shuffle, Prime Minister Ranil Wickremesinghe was appointed as the Minister of Law and Order. The Prime Minister will also function as the Minister of National Policy and Economic Affairs. However, sources at the Prime Minister’s office said that Premier Wickremesinghe has accepted the Law and Order portfolio only for a short period of time. Minister Sagala Ratnayaka who was the Law and Order Minister before, was appointed the Minister of Youth Affairs and Southern Development. Minister Harin Fernando was given the ministerial portfolio of Foreign Employment, in addition to his Digital Infrastructure Ministry. The Foreign Employment portfolio was earlier held by Minister Thalatha Atukorale who is the Justice Minister. Lakshman Kiriella, who was the Higher Education and Highways Cabinet Minister, was appointed as the State Enterprise and Kandy Development Cabinet Minister. UNP General Secretary Kabir Hashim, who held the Public Enterprise Development portfolio, was appointed as the new Higher Education and Highways Cabinet Minister. Ravindra Samaraweera, who was the Labour and Trade Union Relations State Minister, was appointed as the Sustainable Development and Wildlife Cabinet Minister, a portfolio held by Minister Gamini Jayawickrema Perera. Perera will remain as the Minister of Buddhasasana. Piyasena Gamage who was the Law and Order State Minister was sworn-in as the Youth Affairs and Southern Development State Minister. Ajith P. Perera who held the portfolio of Power and Renewable Energy Deputy Minister was sworn-in as the Prison Reforms, Drug Prevention and Community Correction State Minister. Dr. Harsha de Silva, who was the National Policies and Economic Affairs Deputy Minister, has been appointed as the National Policies and Economic Affairs State Minister. Kurunegala District UNP Parliamentarian J.C. Alawathuwala was appointed as the Home Affairs Deputy Minister. They all took oaths before President Maithripala Sirisena at the Presidential Secretariat yesterday. State Minister of National Policies and Economic Affairs Dr. Harsha De Silva speaking about the changes said it will help the government to forge ahead with new vigour. The State Minister of Fisheries and Aquatic resources Development Dilip Wedaarachchi told Daily News that the Cabinet reshuffle will make a positive change in the affairs of the government and more changes are expected in the next two weeks in the portfolios held by UPFA ministers. Meanwhile, newly appointed Minister of Sustainable Development and Wildlife Ravindra Samaraweera told the Daily News that he will strive to find sustainable solutions for the Human-Elephant Conflict on a priority basis. He also said that a special programme will be implemented to solve matters relating to national parks and forest reserves. Reflecting on the protection of animals in the national parks and reserves Minister Samaraweera observed that it is necessary to recruit more wildlife officers and said he will take necessary steps in the near future. He also said he will look into matters such as salary anomalies and promotions of the wildlife officers as well. Minister Smaraweera also said that he will implement a special conservation programme for the protection of the already dwindling tuskers in the country. Minister of Digital Infrastructure and Foreign Employment Harin Fernando commenting on the Cabinet reshuffle said it is important that the government listens to voice and demands of the general public when moving ahead. Minister Fernando also observed that the reshuffle contained no drastic changes. “There perhaps will be more changes in the next week.” he added. He also said a team of professionals have been appointed to expedite the ministerial work and provide an excellent service to the public within a very limited time frame.